Just rant about hypnosis. Go crazy! But not too crazy… 65% crazy, 35% sane. I wish that hypnosis was more accepted, and that will only happen when it is more widely seen or experienced, and not just as entertainment but as a helpful medical and social practice. I have a crazy idea that students be taught sometime in their early teens such elementary self‐hypnosis techniques as pain control, concentration, meditation, fear control, etc. Of course that would drive certain sectors of society crazy, with claims of “mind control” and worse. [The latter being the “crazy” part.] That, and some form of martial art, preferably one of the “softer” arts like Aikido or Tai Chi, with an emphasis on self‐defense and conflict avoidance. Preferred method of induction? I.e. pocket watch, pendant, crystal, spiral, fixation, etc. Yes, all of them mentioned above, and more. I have a passion for stereotypical inductions of all kinds, the more stereotypical, the better. But my most favorite must be the classic “look into my eyes” fixation induction, especially when looking into the eyes of a lovely female hypnotist. 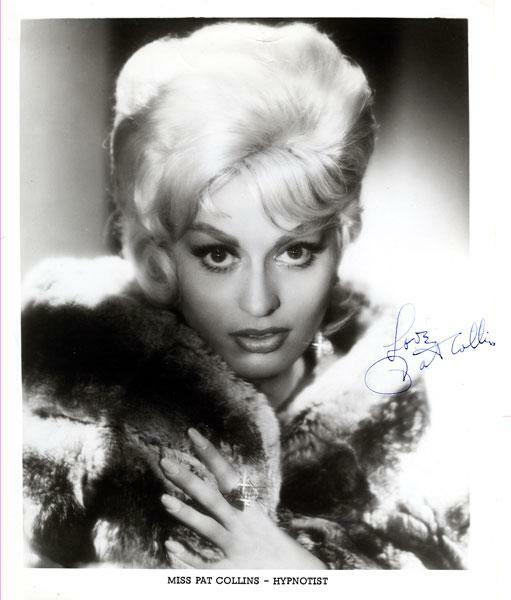 And who better to epitomize that than the “Hyp Hypnotist” herself, Pat Collins. What was it like the first time you were tranced or tranced someone? Actually, I should amend that to the first two times I was tranced. This is a story I often tell to persuade people that hypnosis is real. In 1984, I attended a convention in Cleveland, Ohio. I primarily wanted to meet Marion Zimmer Bradley, the writer and creator of the Darkover novels and stories, but the real treat was in meeting Katherine Kurtz. I knew Katherine from her Deryni novels, a series of novels set in a medieval fantasy setting much like medieval Europe, where the magic is primarily used by the Deryni. The Deryni are a mutation from humanity which grants them psychic powers, including telepathy and telekinesis, plus what can only be described as magic. One of the telepathic talents used was the ability to induce a hypnotic trance state in unsuspecting or unwarded subjects. It should come as no surprise, then, that Katherine was trained as an Ericksonian hypnotist, and she regularly wrote that into her stories. On the final day of the convention, Katherine and a few others participated in a panel on hypnosis, and as part of it, she did a group induction and two guided imagery sessions for the audience. I participated wholeheartedly and that is a memory I still treasure. Which leads to the second time I was ever hypnotized. A good friend of mine just finished training as a hypnotist, and I invited him to come to the monthly meeting of the local Doctor Who fan club, where performed a demonstration of hypnosis for the members of the club. (I should point out that we would watch a Doctor Who episode at every meeting: this time it was ‘Masque of Mandragora’, which has one of the most evocative hypnosis inductions ever.) After the meeting was over, I volunteered to do a more personal demonstration for another of the club members. He gave me the traditional post‐hypnotic amnesia suggestion and brought me out of trance. And that’s when I went into a fugue state. I couldn’t think, I couldn’t speak: I could only mouth words that I didn’t know how to say. It only last for maybe 15 seconds before I was put back into trance and then the suggestion was removed. I didn’t understand then but I believe I understand now what happened: my subconscious understood the suggestion to forget being hypnotized to mean forget ever being hypnotized, and my previous experience was something I definitely wanted to remember, so the two impulses were in conflict and my mind was frozen. And those were the first two times I was ever tranced. She was the most famous female hypnotist ever. She appeared in four cable network specials, numerous talk shows and game shows, at least four different TV programs as her self, and one movie appearance. She had her own club on the famed Sunset Strip in Hollywood and was friends with numerous Hollywood personalities. In between that, she also had a successful hypnotherapy practice and instructed other professional hypnotists. Very few, if any, did more to dispel the fallacies about hypnosis during her life. No other hypnotist had such an impact on the popular culture, yet few people now remember her. Well, now that should change. To purchase a copy of the documentary, go to the Miss Pat Collins website. I know I will. As a special Holiday present, I present the (physical) Hypnosis in Media collection in its semi‐entirety. The bookshelf unit here holds the main part of the Collection. As you can see, it is divided in half, with the left half holding figures and artwork behind the glass doors, larger books and folders below, and the doors below holding the media elements that don’t fit anywhere else. 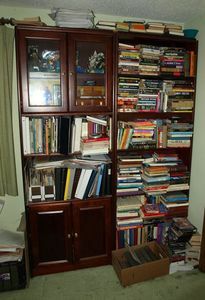 The right half holds most of the fiction and nonfiction books. As you can see, the bookcase is by no means large enough to hold everything, as there are parts of the collection on the floor before it. This is the upper part of the left half, which has the figures and artwork. On the upper shelf you can see the two figures from the Silent Screams figure line, from the movie “The Cabinet of Doctor Caligari” on the top, along with the Princess Ariel figure, and smaller toys with hypnotic themes in the middle. 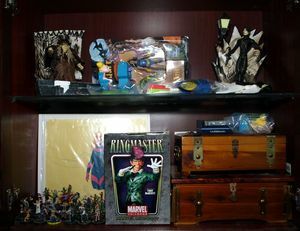 At the back of the lower shelf as a animation cel of Hypnotia from the “Iron Man” animated series, several dozen HeroClix figures in the lower left and my latest acquisition, the Ringmaster mini‐bust, in the center. The boxes on the right contain a number of stereotypical hypnotic foci, including several crystals and even a couple of hypno‐disks. The HeroClix figures are a large but not complete of all of the characters with hypnotic or mind control abilities, including Professor X, Saturn Girl, Super‐Gorilla Grodd, the Puppet Master, the Mad Hatter, etc. 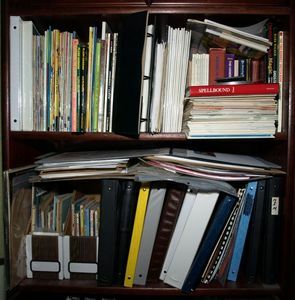 The folders and notebooks on the shelves below the glass doors consists of the results of research projects carried out in the past, including the material behind the search for ‘Secrets of the Sleep Merchants’ detailed elsewhere, a set of publicity photographs of Pat Collins and details of her life, comic strip and book collections and reference materials, smaller magazines and pamphlets that might get damaged if put elsewhere, the two records released by Pat Collins, as well as anything that doesn’t fit in anywhere else. The fiction part comprises roughly 200 pieces, including several collections, double‐stacked on the first two shelves and in front of the non‐fiction stacks on the third shelf. The non‐fiction section also contains roughly about 200 books, not including the various pamphlets and booklets that are in another bookshelf. 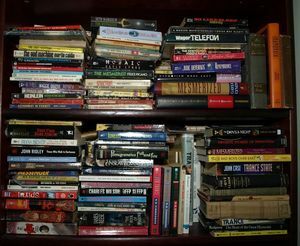 These books are strictly hypnosis related: there is a separate section for media references, such as indices and reference books on various TV series, movies, etc. This is by no means the complete collection: there is a storage case with several dozen video tapes elsewhere that I am slowing digitizing and converting to DVD format, along with the comics collection stored in the garage, as well as the regular fiction collection that takes up most of another bedroom / library. All in all, I estimate I have somewhere in the range of 500 — 600 books, over 250 comics and dozens of magazines and papers in the collection proper and maybe another couple hundred books and I can’t even guess how many comics elsewhere.